Today a special ceremony was held at the magnificent Bonython Hall to recognise University of Adelaide’s first-year scholarship recipients. Two Endeavour College Old Scholars, Jake Whitehead and Mohammad Danish Mangi were among those who were presented with scholarships. 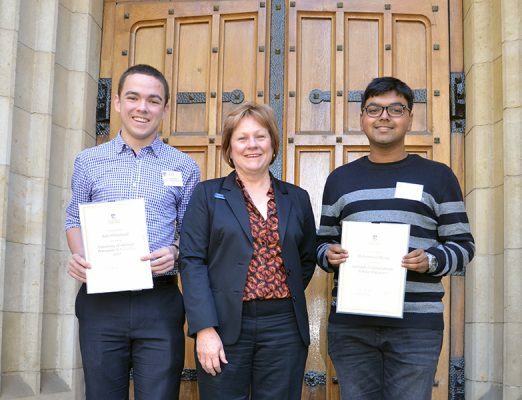 Jake Whitehead received the University of Adelaide Principal’s Scholarship for 2017, while classmate, Mohammad Danish Mangi received the Adelaide Undergraduate Scholarship 2017 for his outstanding ATAR. The College community extends their congratulations to both Jake and Mohammad for their continued excellence and success. Jake (left) and Mohammad (right) are pictured here with Endeavour College Principal, Heather Vogt.